When you’re looking for the perfect combination of durable construction and effective sun reduction for your Las Vegas home, look no further than Ultra Patios and the elegance of our lattice patio covers. 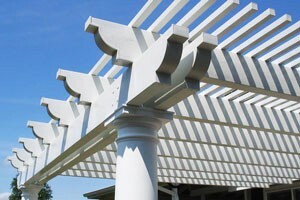 We have over 35 years of experience building and installing patio covers across the Las Vegas Valley. We have made a business of helping homeowners make the most of their living space. You too can extend your usable space and take full advantage of your home while increasing its overall value. Lattice construction means that your patio roof will be formed by crossing and fastening metal pieces together, leaving a square space in between each piece so that it resembles a grid or trellis. With a palate of popular colors to choose from, you can select a richly textured finish that complements your home. Our Laguna Lattice option adds an elegance and charm to any exterior space, and our use of Alumawood means your patio cover won’t crack, peel, fade or rot over time. Talk about a smart investment! Visual appeal and sophisticated design are just some of the many benefits you’ll receive from your new lattice patio cover. Your backyard will be converted into an outdoor oasis perfectly suited for grilling, lounging, a hot tub and entertaining under the protection of your new patio cover. Our Laguna Lattice patio cover significantly reduces the impact of the harsh Las Vegas sun while still allowing the cool breeze in. You can also surround your patio with lush plants and vines that don’t require full sun, and then watch them thrive under the lattice cover. We can customize your lattice patio cover to increase or decrease the amount of sunlight that comes through by adjusting the space between the lattice beams. After that, you can choose from several popular color choices and various column options. Finish it all off with custom features such as a ceiling fan and patio lights to create the ideal patio for you and your family. Experience the delight of having an outdoor retreat that allows you a much-needed respite from sun and heat. We’ve been helping Las Vegas Valley residents for over three decades; now you can discover all the possibilities that a lattice patio cover can provide by giving Ultra Patios a call today.